The 4:1 Input Voltage 500 Watt Single MXW DC/DC converter provides a precisely regulated dc output. The output voltage is fully isolated from the input, allowing the output to be positive or negative polarity and with various ground connections. 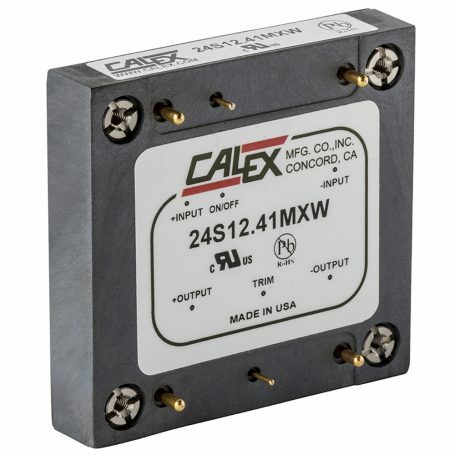 The 500 Watt MXW meets the most rigorous performance standards in an industry standard footprint for mobile (12VIN), process control (24VIN), and military COTS (28VIN) applications. The 4:1 Input Voltage 500 Watt MTW includes trim and remote ON/OFF. Threaded through holes are provided to allow easy mounting or addition of a heatsink for extended temperature operation. The converters high efficiency and high power density are accomplished through use of high-efficiency synchronous rectification technology, advanced electronic circuit, packaging and thermal design thus resulting in a high reliability product. Converter operates at a fixed frequency and follows conservative component de-rating guidelines. Click on the link below for an instant download.